1. Preheat the oven to 200°C, gas mark 6. Mix the olive oil with the paprika and brush evenly over each corn tortilla. Cut the tortillas into triangles and arrange onto 2 baking sheets lined with baking parchment. Sprinkle with oregano and bake in the oven for 7–8 minutes, or until golden and crisp. 2. Scrape the avocado flesh into a bowl and mash with the juice of 1 lime. Season and set aside. 3. Stir the juice and zest of half a lime into the crème fraîche, and set aside. Deseed and dice the tomatoes, then mix together with the red onion, chilli, coriander stalks and a little oil. Season with a little salt and black pepper and the juice of the remaining half lime. 4. Preheat the grill to high. Arrange the crispy tortillas on a heatproof serving plate, scatter with grated cheese and place under the preheated grill for about 1-2 minutes, or until the cheese has melted. 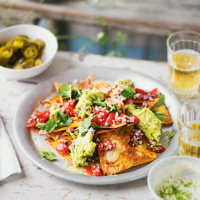 Top with the smashed avocado, and scatter over the tomato salsa and torn coriander leaves. Serve with the lime crème fraîche for dipping, and some jalapeños and hot sauce.